BCI's bungee cords are designed to operate between 325% and 400% elongation and provide a very smooth ride for your clients, by creating g-forces between 2.4 - 2.8. Cords meet or exceed CBA, NABA, BERSA, SANZ and Australian specifications. BCI cords are the finest available because they made with the highest quality materials, are manufactured with exclusive proprietary methods which maximizes the strength and predictability of the finished product, and have built into them several safety features not found on most other cords. The rubber itself is highly specialized and designed specifically for bungee. It has a linear stress vs. strain ratio throughout the entire 400% elongation. Many other rubber designs begin to curve upwards between 300-400%. The rubber offers a dual helical binding of threads to minimize premature wear and distortion. It is also formulated with special compounds and additives which offer ozone and UV protection - the largest factor responsible for the deterioration of the rubber. It also has a special silicon coating which minimizes friction between the individual strands of rubber and offers overall abrasion resistance. Most of the rubber used today is still coated with talc. Do you know what your current supplier is using? During the manufacturing process the rubber at the ends of the cord which surround the bobbins is wrapped under tension to eliminate any movement, thus preventing wear between rubber and bobbin. All cord end connection points are made redundant using three layers of individually sewn 1" mil-spec tubular webbing. The length of the cords are double-wrapped in opposite directions to ensure the elimination of 'soft spots' on the cord, maintain structural integrity and thus maximize cord life. All cords come equipped with the latest safety and protection features, including a backup, fall-arrest system and protective sheath for abrasion and foreign material resistance. The sheaths are also colour coded for ease of cord selection. 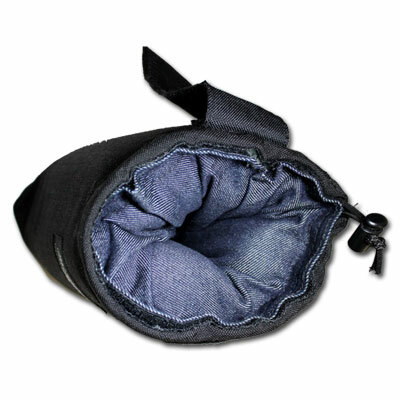 Sewn leather wear pads at carabineer connection points are used for ease of hook-up and abrasion resistance on the materials under load. 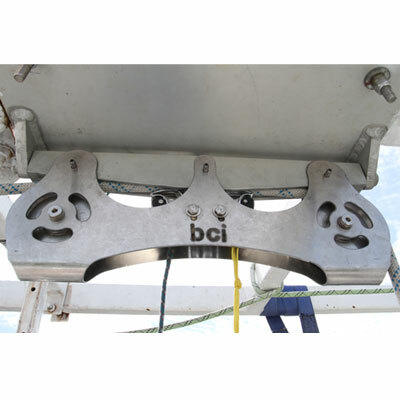 All equipment used by BCI has been specifically designed and engineered for bungee jumping or rescue applications. We do not use, sell, or advocate the use of "off-the-shelf" rock climbing equipment. The equipment BCI sells meets or exceeds CBA, NABA, BERSA, SANZ and Australian specifications. In addition many of the items also have UIAA, ULI and NFPA approvals. All harnesses are UIAA approved and are designed to give a minimum of 10:1 safety factor when used as instructed. They also meet or exceed CBA, NABA, BERSA, SANZ and Australian specifications. 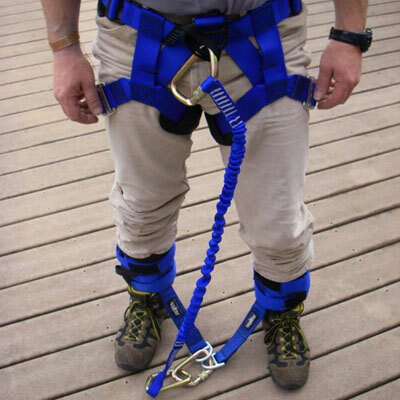 There are several different harness designs, not shown, which are available. BCI can also do custom designs to meet your needs. If there are features you would like incorporated your harnesses, let us know. Double padded with one or two buckles on each ankle, constructed with heavy-duty 2" mil-spec webbing. 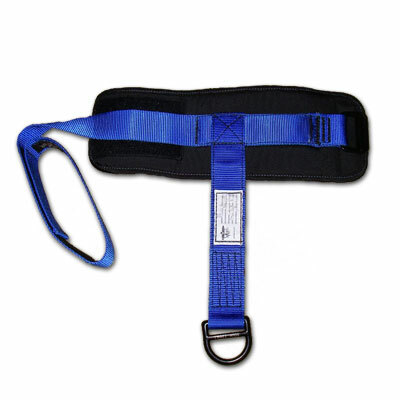 Includes backup safety strap which is attached to a body harness system. 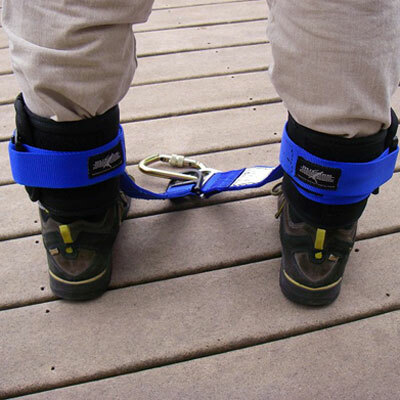 Ankle harnesses can also be custom made to your specifications. An adjustable Waist Harness (padded w/ quick buckles). Waist and legs are fully padded. Large "D-ring" attachment point at front. "D-Rings" are coloured coded for sizes XS, S, M, L and XL. Adjustable buckles with spring-loaded locks (optional) on the waist and legs. Large D shape for great handling, huge gate opening and massive strength! At a rated strength of 72kN, it's one of the strongest carabiners in the world! Heat-treated, half-load tested (over 8000 lbf.) and built to exacting standards, the ½" Large D is one very fine steel carabiner. Same "D" shape as our 7/16" model, but with bigger material for increased strength. Same great handling and use characteristics but with a strength rating of 63kN (that's over 14,000 lbf.!). Like all our carabiners, every ½" Modified D is individually proof-tested to half it's rated strength which means every one of these has been proven to hold over 7000 lbs! Same as the Jake Sr. carabiner however with a 20 mm gate opening as opposed to the Jake Sr's 24 mm gate opening. UL Certified to NFPA 1983 "T" Technical Use. Uses high efficiency sealed ball bearings bushings and are designed to work flawlessly under conditions that might shut down a lower quality pulley. BCI offers a full selection of slings and kernmantle and double-braided ropes from 3mm accessory cord up to 24mm (1 inch) in all types of materials such as nylon, polyester, spectra, kevlar, and steel. Let us know your application and we can provide the rope size, material, and braid best suited to your needs.